← NEW YORK KNICKS…ONWARD AND UPWARD OR SPINNING WHEELS? I had turned 5 on May 12th, 1957. It was a different world…a different time and place. Gasoline was 24 cents a gallon. I vaguely remember the grownups complaining about the Dodgers leaving town. The folks were talking about spending $79.95 on a new Stereo Hi-FI music system at Korvettes. Dad was working at the TV station in New York City. That July day we were at the favorite family summertime escape up in the New Paltz area of New York State at a small bungalow colony. Every morning I’d get up and walk down to the creek, bucket and fishing pole in hand hoping to catch a fish or two…or maybe I’d be chasing down a crayfish under a stone over by the waterfall that fed the small pool. If my memory serves me well it wasn’t a brutally hot summer. Just a warm sunny season, cooled by the trees and mountain breezes. We were living in the Bensonhurst section of Brooklyn in those days and spending time in the mountains was a great escape for the adults, and certainly for a little kid used to asphalt, concrete playgrounds and car horns. It could just be the haze of the passing years but it seemed like a quiet, peaceful and happy time. Some guy named Elvis was all the rage but I wasn’t exactly sure why. Halfway around the world an event was taking place that would change the course of world history. A young man with a strong voice and lot of confidence was in the midst of setting up his equipment. 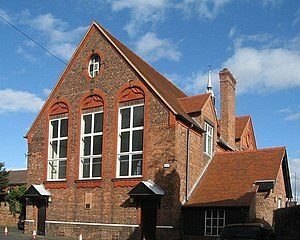 He and his band, THE QUARRYMEN, were scheduled to take the stage at 8pm that evening, in the garden courtyard of a small church in Liverpool, a grubby industrial seaport town in England. That would’ve been right about the time I was headed to bed up in the mountains. As the 16 year old John Lennon was busy getting ready, one of the members of his band, Ivan Vaughn, introduced him to a younger school friend. “John said ‘hello,’ but as usual he was very withdrawn,” recalls friend and percussionist Pete Shotton. “He was always very suspicious of other people and wanted to make them come to him. He wasn’t always outgoing as a kid, but after a few minutes of standing awkwardly and saying virtually nothing, Paul, being the exuberant type of person that he was, got his guitar out and started playing, and then he and John had this thing in common.” The then 15 year old Paul McCartney introduced himself and within minutes was doing an impromptu audition. He whipped off a few rock n roll classics from Gene Vincent, Little Richard and the like showing young Lennon his capabilities. 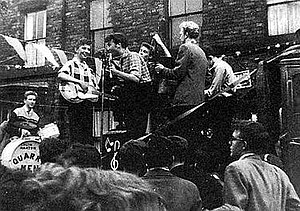 After they chatted for a few more minutes THE QUARRYMEN began their show for the evening. McCartney remembers the scene. ““I just thought, Well, he looks good, he’s singing well and he seems like a great lead singer to me,’” McCartney said of Lennon’s performance to Record Collector magazine in 1995. “Of course, he had his glasses off, so he really looked suave. I remember John was good. He was really the only outstanding member, all the rest kind of slipped away.” McCartney was also taken by Lennon’s clever word play. “He was doing the Delphonics tune “Come and Go With Me” but he had changed the words to “Come and Go With Me to the Penitentiary”. After the show, Lennon and McCartney went to a pub together. 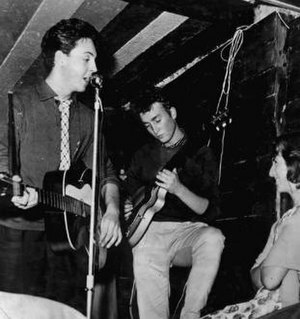 Lennon was so impressed with McCartney’s natural talent and knowledge of music that he and the other members of the group later asked McCartney to join them. About a year later Paul introduced John to George and the rest is as they say “History”. By 1961 I was struggling to learn French in the 4th grade at PS. 186 on 18th Avenue listening to the hit records of that time…The Everly’s “Dream”…Sam Cooke’s “Chain Gang” and Ricky Nelson’s Travellin’ Man”. Little did I know..little did the world know, that a simple meeting of two teenagers in a church garden would irrevocably change not only the course of popular music, but also the areas of pop culture, fashion, politics and media. The profound effect THE BEATLES have had on the world continues to astound writers and pundits the world over. Their recordings, books, memorabilia, and concert tours by both Paul and Ringo, continue to delight multi-generational audiences in many different countries. The LOVE show is a massive Las Vegas hit and all things BEATLE are always newsworthy. Tribute bands abound and Festivals of every kind celebrating their genius are a regular event. All of this because two kids were introduced by a friend on a warm summer’s night…July 6, 1957… in a seaport town far far away…while I was playing BINGO in a barn in upstate New York. This entry was posted in Bio, Music, Pop culture, The Beatles and tagged Beatle, John, John Lennon, Lennon, McCartney, New York City, Paul, Paul McCartney, Quarrymen. Bookmark the permalink. Joe I like to think of these types of events as a cosmic ripple. Things were set in motion that June day that truly changed the course of western culture. I sometimes wonder about these incidents and what would have been if say Paul never made it to the church event. Think about your own existence. What would that be like today. That day and those events set the course for the rest of time. Well I for one would still be musical…I was from a musical family and I was influenced by all of that before I’d heard The Beatles, but I’m sure the massive impact upon my life in general would have been gone…maybe replaced by something else, but that particular impact would be gone. I was a clarinet playing kid who wanted to play tenor sax in a rock n roll band in 1962. I probably would have followed that inclination somewhere but would it have been so important in the landscape of my life? hmmmm. probably not. 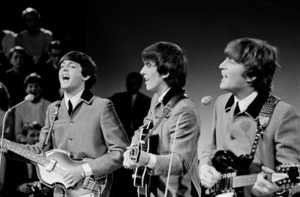 The Beatles didn’t just “music me”…though that was the key element. They told me how to be cool, they told me how to dress, how to be funny, how to meet “chicks”, how to keep an open mind, how to respect and love one all people regardless of race or creed, how to be irreverent, how to play drums, then bass then guitar…they taught me how to work as a “group” with a bunch of guys toward a musical goal. It was college at an early age ! I often wonder about these events. Freddy Lennon almost took young John to New Zealand. Ringo almost dies twice in childhood from various illnesses. Life is crazy like that. Doors close but a window opens. Twists and turns. The odds of life even existing are incredibly small in the great scheme of the universe! Ahhhh but I digress. I’d probably be in Sicily picking mangoes if not for an incredible chain of unrelated events. I never tire of this story Joe, And the pics are, well… fab 🙂 You and I are about the same age… I was 6 the day history was being made across the pond & spent that summer either at the beach, the pool, or riding my bike exploring the neighborhood… not terribly interesting since we lived in the “planned community” of Forest City in Wantagh out in the ‘burbs. At that time “music” was what was played in ballet class or something “classical”, learned for a school piano concert. My parents controlled all sound systems & the only rock & roll I was aware of was via the Ed Sullivan Show. I do remember enjoying hearing Elvis sing “Hound Dog” and being impressed with the Everly Brothers harmonies on “Bye Bye Love.” I don’t think I got my own radio until 1959 or 1960… my life finally had a soundtrack. But when I heard The Beatles for the first time in Dec 1963, music became my life. Danny, I can’t imagine life without Beatles music in it. People of our generation have had many similar childhood experiences for sure. I think it’s safe to say that The Neatles everyone deeply even people who are not musicians. Funny thing…I lived in Forest City in the 80’s…my first house! I can’t imagine what the music scene, and the world, would have been without those 4 kids from England. Sometimes I just think theywere aliens who have stopped by the educate us all! I find my love and enjoyment of the Beatles has grown over the years. I liked and admired them in the sixties but growing up in East New York Brooklyn my “gang” was more into The Four Seasons and the doo wop sound of the early sixties back then. We would sit on the stoop and listen to the WMCA Good Guys. Today I enjoy both the simplicity and complexity of The Beatles. As far a life being a string of chance happenings, I would agree. But it’s what we do with these opportunities of chance that makes all the difference. Hell, if I wasn’t coerced into going out for a beer 31 years ago by my buddies I would never have met my wife of 30 years ! it’s funny but upon seeing them on the Ed Sullivan Show I was not impressed. I was a cocky 11 year old and I loved music, specially the rock n roll of the 50’s. Wasn;t sure what the big deal was. Within 6 months I was swept away like everyone else and with each passing year I find more to enjoy, more to understand and interpret, more to love. I love these stories about The Beatles that may have seemed quite innocent at the time, but which evolved into some of our most important musical history. Or revolutions, as it were. And I liked reading about all of your personal experiences from the time. Although I was only an infant in 1957 (and oblivious to this as it was happening), I was able to get a strong feel for these events the two times I went to Liverpool and the Beatles museum (called “The Beatles Story”), and took a walking tour of The Beatles’ London. Opportunities of chance is name for it. Serendipity, perhaps, another? BTW, did everybody live in Wantagh at one time? 🙂 I did, too, from 1960-1963. It was our first Long Island home after we left Brooklyn. A little serendipity there, if I don’t mind sayin’! I would like to get to Liverpool and see all the places they lived, laughed loved and worked…and I’m sure I will at some point before I leave this world… Synchronicity too.. I know that very well. Brooklyn was and is quite a place. We lived a few blocks away from Lenny’s Pizzeria on 86th Street, under the EL ! Ah, the El…we lived our life back then under the Jamaica Ave and Fulton Street El. Anyone who grew up in NYC knows the El. It was a constant. It was like a big steel river running through our lives. Isn’t it great how a conversation about the Beatles has led to memories of growing up. Linda and I both feel that one of the reasons we enjoy their music as much as ever are the memories associated with the music. The Beatles were so much a part of this generation’s formative years it’s a natural progression but what strikes me as even more amazing is the way they have captured the 2 generations that have followed us. Being in a Beatle Tribute as I am, I get to see the faces of the people. Kids from 10 to 20, middle aged people 25 to 40 and of course all od us old geezers comes to the shows to hear the music. It is truly a multi-generational phenomena. In the true spirit of their times and music, The Beatles continue to bring all people together. It really is a joy! We get a kick too when we look around at a Shuffle gig and see people of all ages singing along on songs from over 40 years ago, some weren’t even born when the song was a hit. Here’s a question out of left field, but here goes…what are your favorite Beatle songs to play as a muscian ? Hmmmmmmm I guess all of them! LOL Some more than others but I do enjoy playing them all. I would add…I Feel Fine and Help as all time faves. Eleanor Rigby is a wild tune. Everything about it is such an extreme development in songwriting at that time.